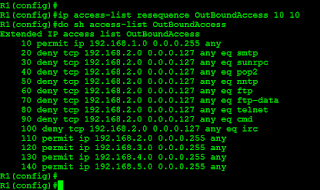 Note: ACL are used in firewalls / routers to filter packets and restrict traffic to/from certain spots. In this article I am just going through implementations of various ACL as a overview and not covering the details. You can go through internet to search for details about them. However if you are stuck then email me and I will try to help in best possible manner I can. The address is h i [ a t ] d e v h a r s h [ d o t ] m e.
Access Control Lists are used to filter traffic based on incoming or outgoing address, port, and protocols. ACL can be named or numbered. There are various types of ACL. 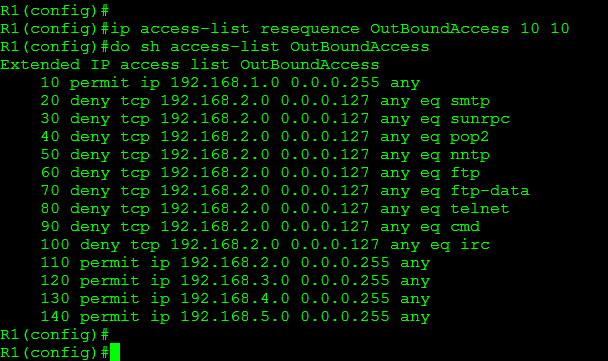 It is the simplest ACL and it deals with source traffic. It has provisions to specify source and destination details. Just need to specify one parameter in extended ACL.